Best Han Solo Comics To Read With "Solo: A Star Wars Story"
There are of course exceptions to the rule, with many of the best examples found in the pages of Star Wars comics throughout history. From the obvious (the Han Solo miniseries published by Marvel Comics in 2017) to the more obscure (That time Han Solo and Boba Fett got trapped on a planet together in Star Wars Tales (2004)), these are the most entertaining and relevant comics to read before or after Solo: A Star Wars Story. Han’s first Marvel Comics standalone miniseries is rightly the most sensible starting place for most new comic book readers. Written by the phenomenal Marjorie Liu, with art by Mark Brooks, Han Solo is a must-read. It’s worth noting here as well, that the Han Solo limited series is a part of the larger Marvel Star Wars canon, which began with Star Wars #1 in late 2015 (following Disney’s acquisition of Star Wars and the transition of publishing rights from Dark Horse Comics). This is a big reason why the deluxe collected edition of Han Solo includes Star Wars issues #8 to #12. 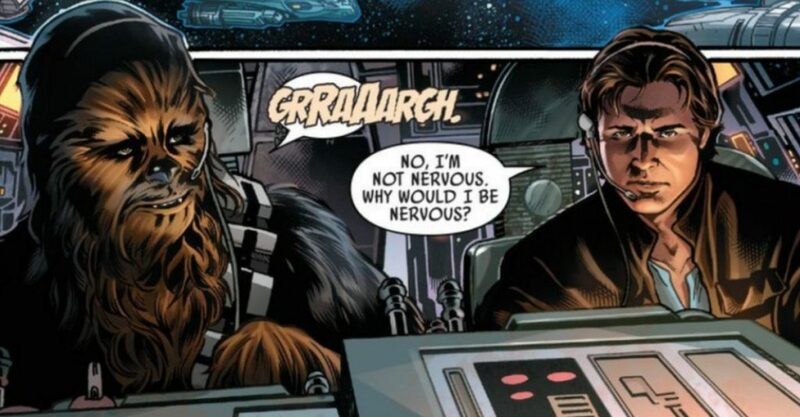 Without spoiling anything, this Jason Aaron written story in the Marvel Star Wars universe provides some of the larger updates for Han Solo’s personal life. If instead, you want only the essentials, I still recommend you at least check out the direction Jason Aaron and John Cassaday take Marvel’s Star Wars with the opening salvo for Luke, Leia and Han. Speaking of amazing character legacies that don’t get as much alone time in the spotlight, the Lando miniseries by Charles Soule and Alex Maleev is as good as they come. Truly, it’s one of my favorite Star Wars comics of both the Marvel publishing and previous extended universe eras. Lando and crew try to pull a classic “one last job” only to find themselves robbing a particularly famous vessel in Star Wars’ lore. Rounding out the major Han Solo supporting cast, and Marvel Star Wars universe limited series, we get to Chewie. Much like the Guardians of the Galaxy’s Groot, the gutteral growls of the famous Wookie can be harder to translate to solo dialogue. The efforts to do so are often all the more impressive, as the comic book craft of the creative team receives more attention. Venturing shortly out of Marvel owned Star Wars territory, we come to 2014’s “Rebel Heist” miniseries, written by one of my absolute favorite comic book writers, Matt Kindt. And when I say “one of my absolute favorite,” I mean I have Kindt’s written and drawn “Mind MGMT” from Dark Horse Comics inside my top 10 favorite comic books of all time! “Rebel Heist” certainly isn’t on that level, but it’s a highly enjoyable miniseries nonetheless, with little prior knowledge required. One of the best ways to enjoy Star Wars comics today is to subscribe to Marvel Unlimited. Shortly after receiving rights to Star Wars comics, Marvel added nearly the *entire* backlog of extended universe comics to their all-you-can-eat subscription service. Browse through series starting with the letter ‘S’ and you’ll find an array of Star Wars comics so vast, no tractor beam will pull you out. I’ve highlighted a few of my favorite Han Solo centric stories from this wide range of comics, including a Star Trek-esque adventure (“The Pandora Effect) written by the legendary Alan Moore, and the time Han crash-landed on a planet with Boba Fett. Comics fans know Greg Rucka as one of the premier writers of the 2000’s, but he’s also an accomplished novelist with a few Star Wars titles to his credit since the time of Force Awakens. While not captured in comics (to my knowledge), this trilogy is one of the most respected and critically acclaimed Han Solo features in the incredible Star Wars extended universe.